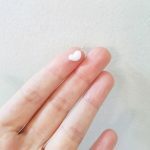 I went through my daily makeup routine and wanted to put this post together for you. Lately, I’ve been trying different ways to minimize my pores because they seem distinct. 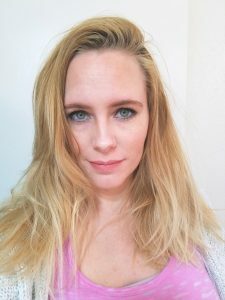 I’ve watched a couple of youtube videos and checked out different makeup products. So, I am going to include what I’ve learned and implemented into my beauty routine to diminish and minimize my pores. 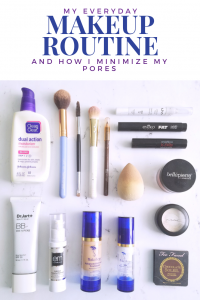 Here we go, from start to finish my daily makeup routine and how I minimize my pores. I put on face lotion first to prime my skin. 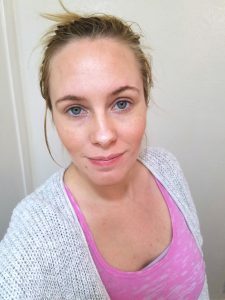 I used to have really bad acne due to my hormones and PCOS. Since discovering the Unblemish routine by Rodan + Fields, it has completely cleared my skin. In the Unblemish Routine, they have a face lotion. 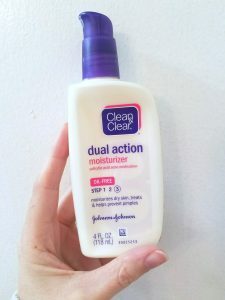 I mix that with a little bit of clean & clear dual action moisturizer. I mix it because it makes the R+F lotion last longer thereby saving money. Both are great moisturizers and SPF blockers. Plus, a bonus is that both keep my skin from soaking up all the makeup causing more breakouts. Second, I prime my skin with pore minimizing remedy. In the past, I’ve tried and used a couple of different ones. My two top favorites are Senegence Silk Pore & Wrinkle Minimizer, and Pore Professional by Benefit. I’ve learned you should let these sit for a few minutes and then move on to your makeup. I take a dab, rub it into my pores in a downward motion and let sit for a few minutes. I’ve gone through phases with my foundation. As I mentioned, I’ve had really bad acne in the past and originally I only used Bare Minerals. I thought it would help keep my skin clear. It didn’t. Then, I switched to Dr. Jart BB Creams. My favorite is the Dis-a-Pore Beauty Balm. It has so many good qualities for your skin and I love that it is a BB Cream so it feels light and doesn’t seem to clog my pores. 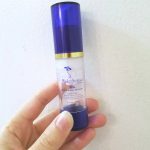 I’ve been wearing it for the past 3 years or so until I switched to the Senegence Anti-Aging Foundation. 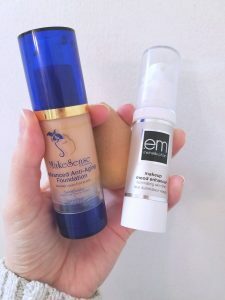 To apply my foundation and minimize my pores, I wet a blending sponge and put my Senegence AA Foundation and a dab of makeup mood enhancer by .em Michelle Phan. I mix the two together with the end of my eyeshadow brush. 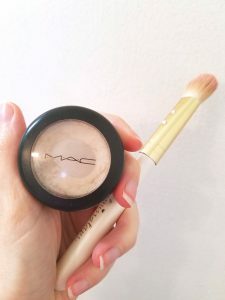 I do this not so much for the enhancer but because the foundation color is a little too dark for my skin tone and instead of waste it or send it back I just lighten it. Minimizing my pores is a basic two-step process. Add the pore minimizer and apply my makeup by dabbing with a blending sponge instead of a makeup brush. In some of the youtube videos I watched, one tip was to then bake a powder to further minimize pores. I just don’t because it is an extra step, and sometimes I don’t have the time to do it. 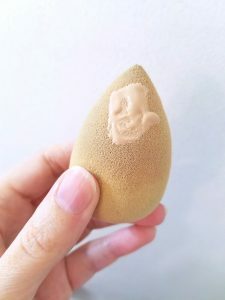 Dabbing the beauty blender on my forehead, cheeks, and chin with the foundation I begin to blend it onto my skin. I continue to blend and dab it all over until my foundation is applied. It is amazing the difference in coverage I get with the real foundation versus the BB Cream! For that reason, I sometimes still just wear the BB Cream because taking it off at night is less troublesome than the foundation. 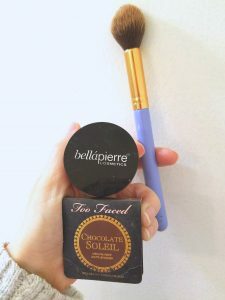 Next, I contour my face with Too Faced Chocolate Soleil and Mac highlighter. I also apply Bellapierre cosmetic blush. I apply the Chocolate Soleil to my cheeks, the side of my nose, my chin and the top of my forehead. Then, I apply the mac highlighter to the tip of my nose, the top of my cheeks, and my jawline to under my cheeks. As I said, I treat these more as a contouring kit than bronzer and highlighter. I apply an eyebrow pencil to my eyebrows not to draw them on but to fill in the holes from my crazy eyebrow hairs. I then blend it in with a brush wand. 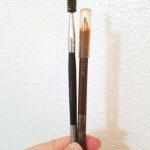 It helps the color not be too dark and tame the brows. Following this, I will apply my eyeliner. The very best eyeliner, in my humble opinion, is the Eyeko Fat Liquid Eyeliner. It has a marker tip, so it makes applying it straight and even super easy. I usually pull my eye to the side to make it a tighter surface to apply to. After applying the black to the top lid, I sometimes put a little on the bottom lid lash line and then smudge it with a straight eyeshadow brush. Alternatively and/or additionally, I will sometimes apply a white eyeliner to my waterline to brighten my eyes. To finish it off, I apply my mascara. My everyday mascara is Smashbox X-Rated. 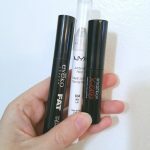 You can see my top three mascaras in this blog post here. I’m all about mascara that adds drama and volume even for my everyday look. This is more often my final step when I am talking about my everyday makeup routine. 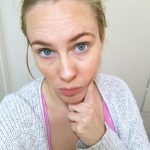 My non-everyday makeup routine would include applying Lipsense and mixing in some eyeshadows. I would love to hear how you do your makeup or how you have found best minimize your pores. I am still learning, but I feel like these few tips and tricks seem to go a long way for me. 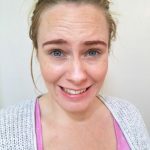 Connect with me via social media or comment below!